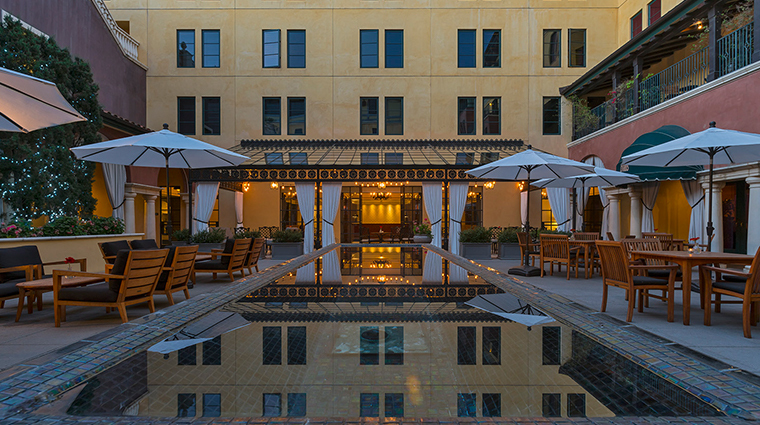 Tucked inside San Jose’s upscale Santana Row shopping center, Hotel Valencia Santana Row sits in one of the city’s most fashion-forward neighborhoods. 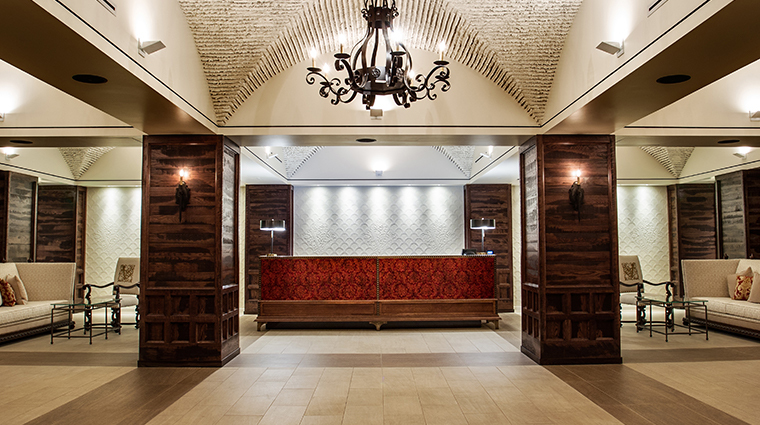 But stylehounds aren’t the only ones you’ll see around this boutique hotel — the hostelry is a favorite bunking spot for pro hockey players, who come to town to take on the San Jose Sharks. 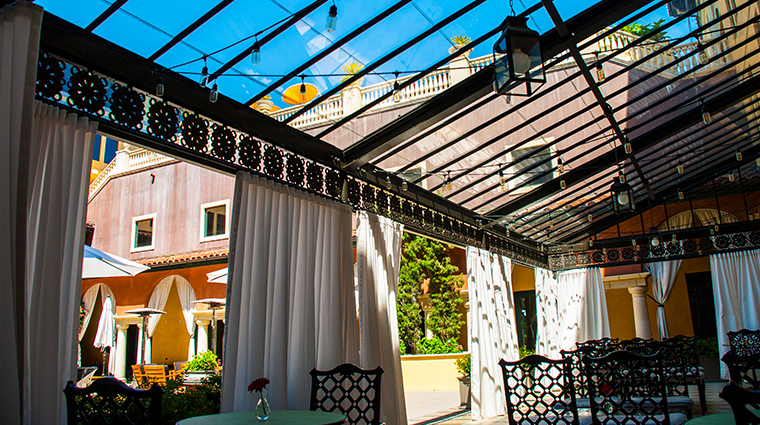 Aside from the people watching, Hotel Valencia offers attractively manicured outdoor spaces designed for lingering, including a courtyard with three water fountains, two outdoor fire pits and comfortable seating. 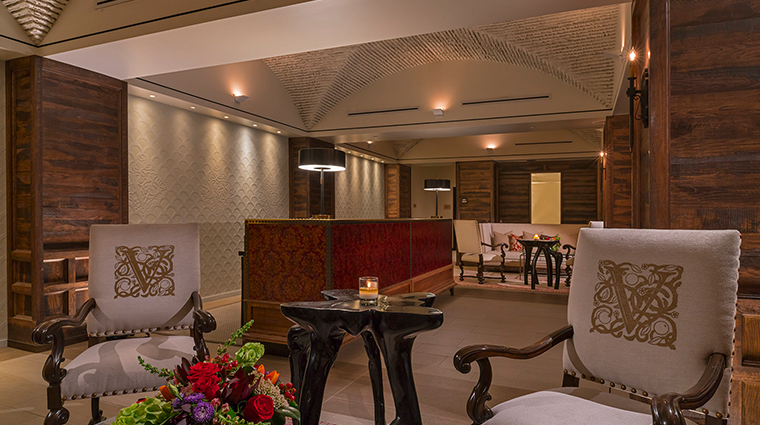 Inside, the decade-old space is set to undergo a renovation, with the spacious guest-rooms, lobby and the hotel's popular lounge Vbar receiving a facelift later this year. 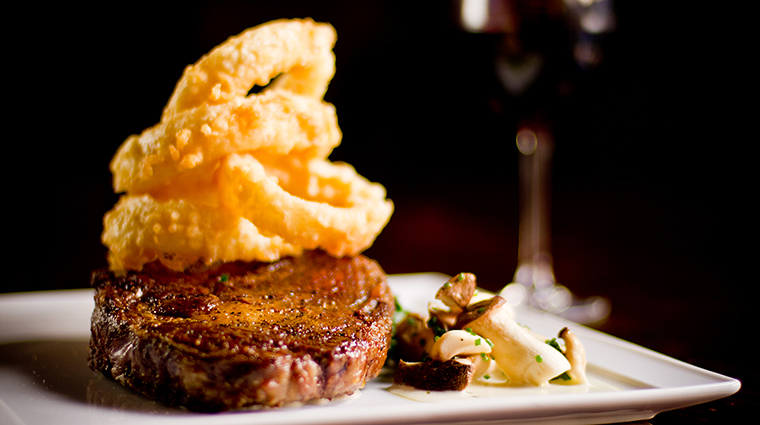 Until then, you'll receive the same casual but attentive service and can still take advantage of that prime location for exploring nearby dining, shopping and nightlife. 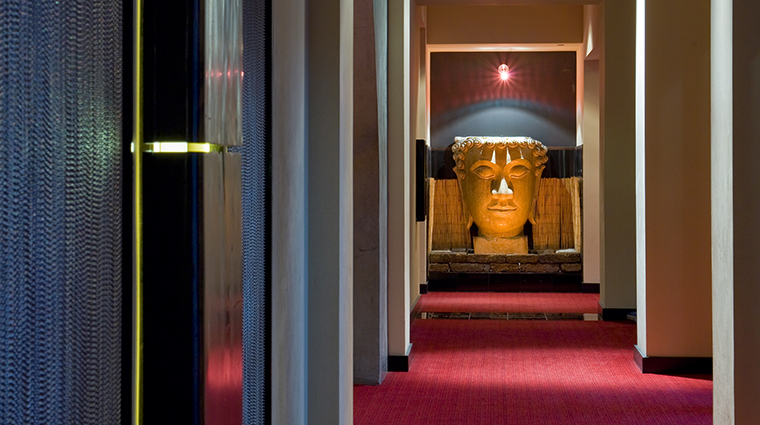 The hotel resides in the chic Santana Row neighborhood of San Jose, California. You’ll likely see budding fashionistas strolling Santana Row in their stilettos, stopping in at Gucci or getting their hair blown out at Drybar. 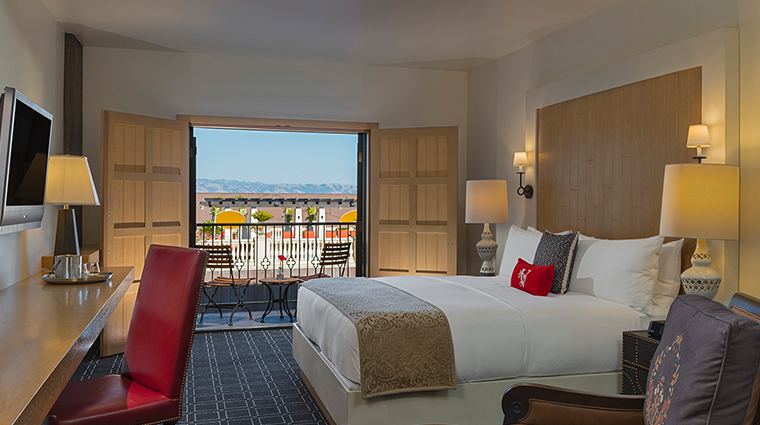 Hotel Valencia is within walking distance of some popular tourist attractions, including the maze-like Winchester Mystery House and the Westfield Valley Fair mall (home to Prada, Burberry, Henri Bendel and more). 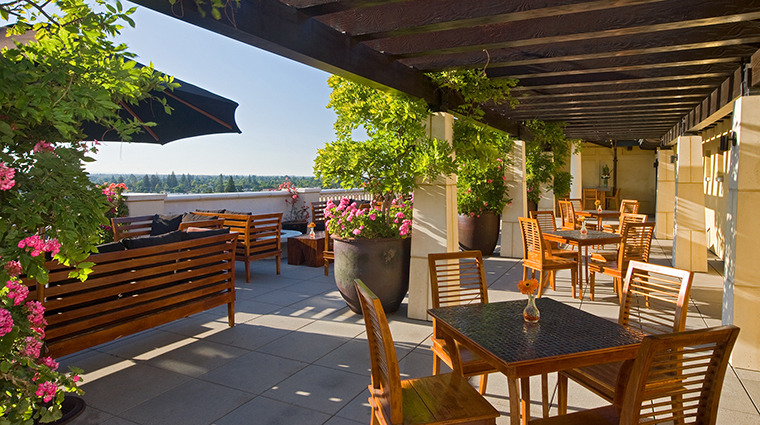 The exterior of the hotel has a European-chic look, given its many terraces and balconies. Perhaps one of the best design features at the San Jose hotel is its ample outdoor space and courtyard, where you can kick back with a cocktail or food and soak up the lovely weather. 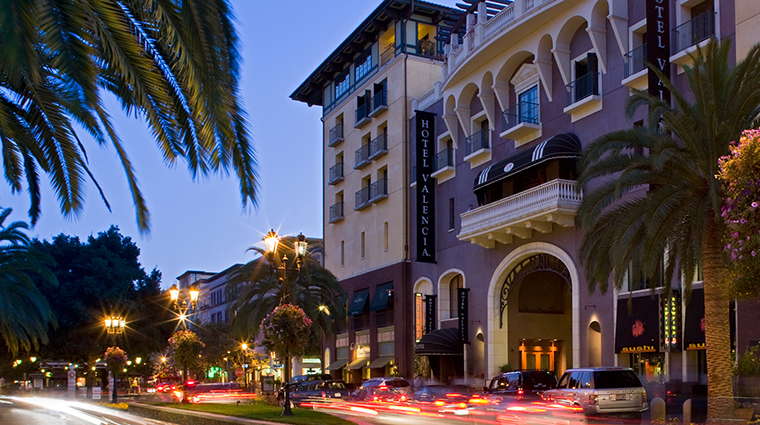 If you’re looking for more activities, you may want to travel to Hotel Valencia and the Santana Row area in the summertime. The complex often has fun events going on during the warmer months (like its free summer music series as well as the popular monthly wine and cheese tastings at Cielo, its seasonal rooftop terrace). The holiday season is another spectacular time to visit the Silicon Valley hotel, since the stores in Santana Row (such as Anthropologie, Kate Spade and Ted Baker) all deck out their windows with festive displays, and the moderate weather makes for a lovely outdoor shopping experience. 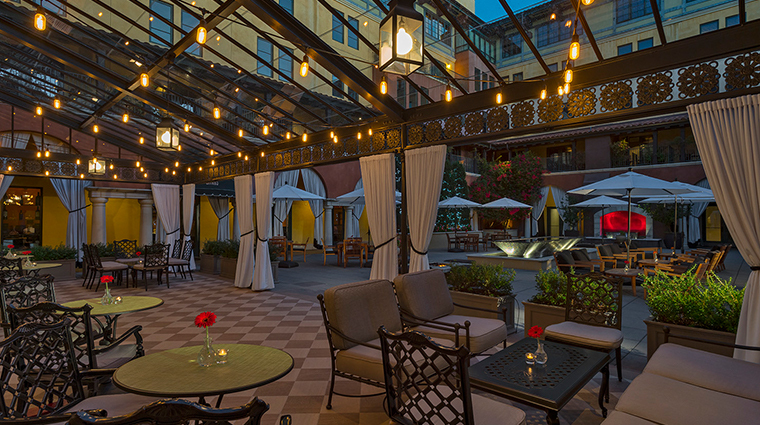 Hotel Valencia’s courtyard has three water fountains and two outdoor fire pits, making it a fantastic place to catch your breath after a busy day wine tasting in the Santa Cruz Mountains or strolling Santana Row. 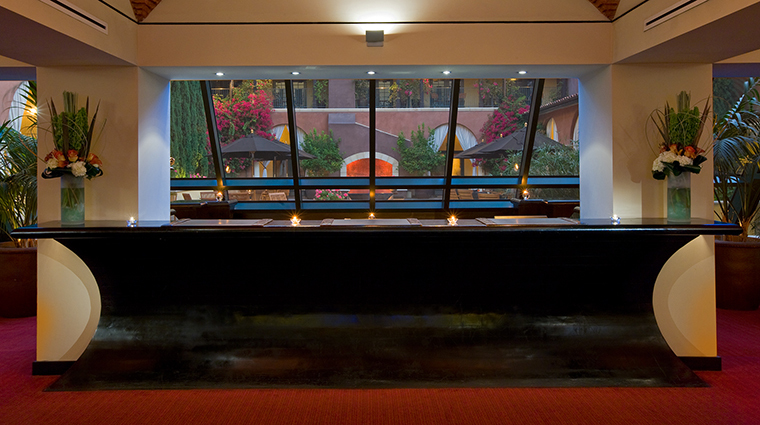 Hotel Valencia Santana Row features 212 rooms, all of which are located between the third and seventh floors of the building. Sixteen of them are suites, including a presidential suite. They sport a contemporary look, with clean lines, cream walls and black accents. 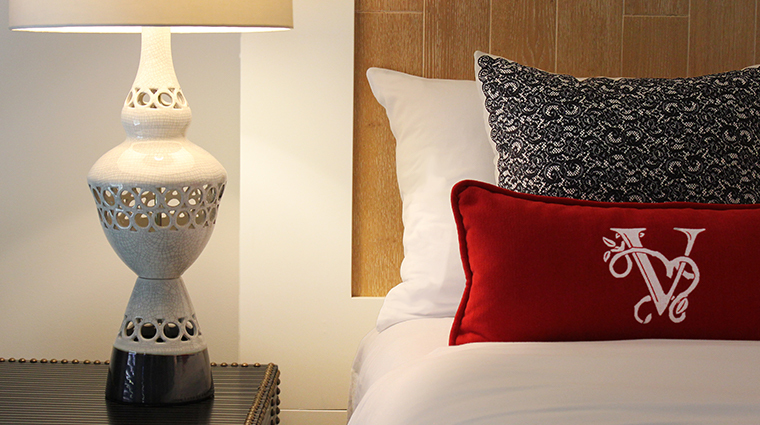 You’ll find dark brown leather headboards, tan leather armchairs, oversized mirrors in thick black frames and bedside lamps that look like stacks of glowing white and black boxes. 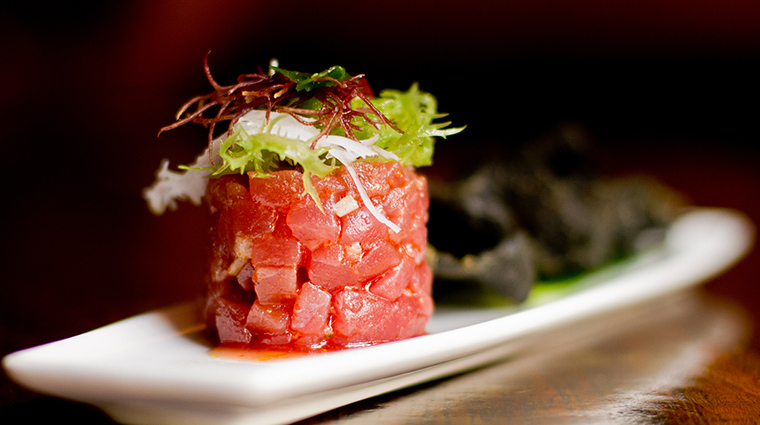 Their best feature may be the view, either overlooking the San Jose hotel’s beautifully manicured courtyard dotted with black cushioned lounge chairs or the buzzing Santana Row neighborhood below. 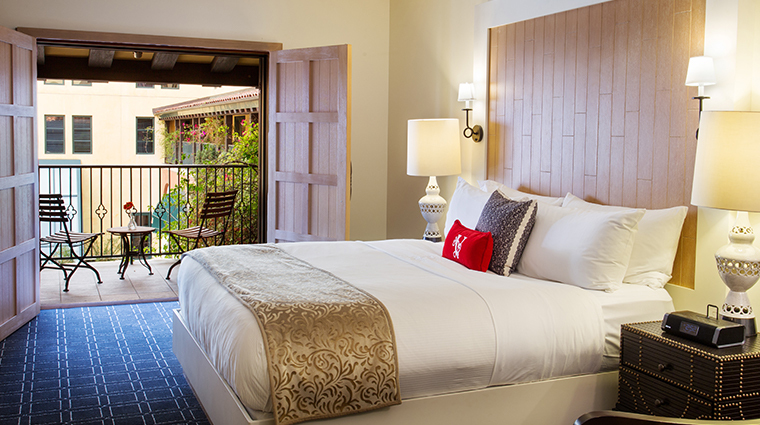 Nearly half of the rooms have balconies, so be sure to request one of them. Of course, this being Silicon Valley, there are the requisite in-room tech amenities, including complimentary Internet access and flat-screen TVs. 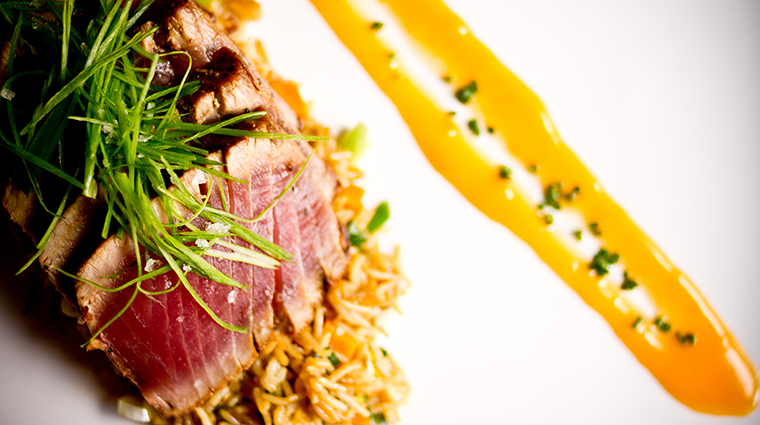 Citrus serves globally influenced California-style cuisine for breakfast and dinner, such as flash-smoked salmon with pistachio tahini, Israeli cous cous, and sorrel. 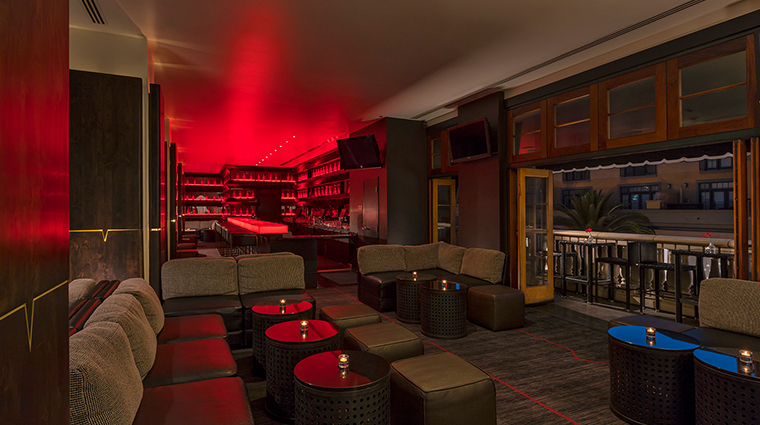 The hotel lounge, Vbar, is as sleek as the rest of the San Jose hotel. Enter the bar via metal-beaded curtains to be greeted with red mood lighting and a fabulous array of cocktails (such as the French 75 with Bombay Sapphire, champagne and lemon juice) along with bites like ahi tuna tartare with nori chips, yuzu and Szechuan peppercorns. 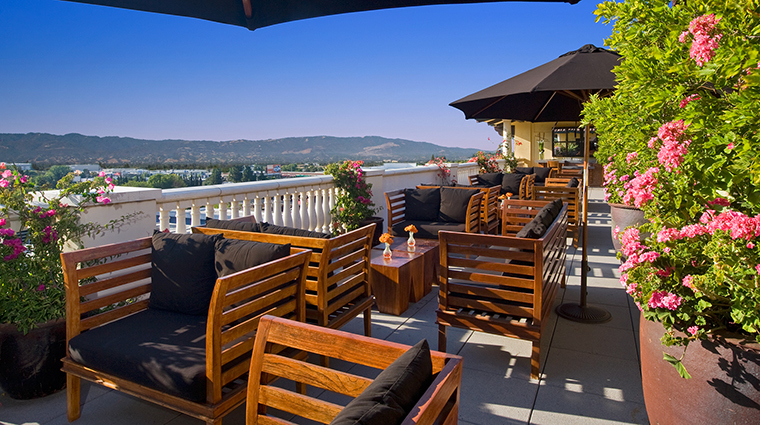 A hidden gem — one that even many locals don’t know about — is the luxury hotel’s Cielo Terrace, a seasonal wine bar offers dramatic views of the Santa Cruz Mountains and Silicon Valley. Nosh on a cheese plate while sipping wine and drinking in the view.